Maoist infiltration of the Labour Party began in earnest in the early '70s. Student radicals, associated with the "Progressive Clubs" and "Socialist Societies" active on most campuses, worked with and eventually took over many university Labour Clubs. In 1972 Peter Franks, a Maoist student leader, later active in the Wellington Marxist-Lennist Organisation and the Workers Communist League presented the Labour Party Youth Conference report, taking the opportunity to mock both Labour Party "conservatives" and his rivals in infiltration, the Socialist Action League; "Most of us at this conference would probably admit to being socialists. We all know, of course, that the Labour Party is as much a socialist party as the Socialist Action League is a revolutionary party; but we still feel that we, at least, are still socialists. And sometimes we sing the Red Flag to prove it." Maoist fronts like HART and the Committee on Vietnam also attracted many future prominent Labour politicians. Even the young Maoist radical, Sue Bradford joined Labour for a time in the late '70s. Wellington student Maoists worked closely with activists such as Pat and Cath Kelly who joined Labour after being expelled from the Communist Party of New Zealand in 1970. Pat Kelly in particular continued to meet secretly with the Wellington Maoists, long after joining Labour. Influence was also exerted through increasing Maoist influence in Wellington and Auckland trade unions. The Public Service Association , New Zealand's government employees union was a particular target. After the formation of the Workers Communist League in 1980, Maoist influence in and on Labour became more organised. By the late '80s however Workers Communist League aligned Labourites were becoming increasingly frustrated at Labour's increasingly cosy relationship with their rivals, the Socialist Unity Party and the seemingly unstoppable liberal economic policies of Finance Minister Roger Douglas. Consequently, the Workers Communist League began attempts to build a left wing electoral alliance independent of the Labour Party.Many informal meetings were held, including in 1986 a series of "Winter Forums". One, held in August in Palmerston North looked at "Alternative Strategies-Political and Economic". Those attending included members of the Workers Communist League, Socialist Action League, Values Party, Labour Party and some independent left wing activists. Auckland activist Bruce Jesson (later a key figure in the Alliance and New Labour parties) called for an ecumenical left, reaching into the Labour Party. Massey University academic and socialist, Steve Maharey (now a senior Labour cabinet minister)allegedly outlined his reasons for working towards socialism inside the Labour Party and told the audience of what he saw as a looming power struggle in the party. Maharey was probably referring to the struggle against "Rogernomics" and its supporters inside labour which was just getting underway at the time. According to columnist Chris Trotter, (a former Labour party official, himself close to the WCL in the 1980s in Dunedin) Maharey was. in the late '80s "charged with reconstructing Labours policy base". Another attempt was made to influence Labour in more desirable direction through a "Broad Left" grouping. by Peter Cullen, a Wellington union official and Labour activist long on the fringes of the Maoist left. 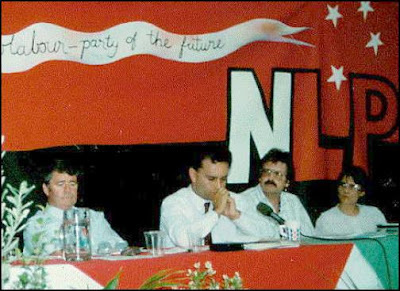 In 1989 things finally boiled over and Jim Anderton announced his resignation from the Labour Party and the formation of the "New Labour Party". The Workers Communist League joined the New Labour Party en masse and most sympathetic Labour activists followed suit. A few highly placed Workers Communist League sympathisers or former Maoists remained in Labour however and their ranks grew as some comrades later joined, or re-joined the party. Hey Trev, another George Rosenberg type expose, this time on "commie" Peter Cullen ! Indebted to you for the warning. Thanks. If my memory serves me 30 years ago his gear was sort of leftie-grunge-chic, but have you seen the suits this nowadays pretty much up-there lawyer wears ? I'll bet the Riddifords and other scions of Wairarapa landed aristocracy use the same tailor ! Love your Part 8 Trev - socialist extremists have Helen Clark and her Blairesque "New" Labour Party in their thrall do they ? "Reflex" back in action for a minute there I think Trev. Give it up man.....there's no future in it. Obviously not.....even The Chickenhawk goes calling on them commie boys nowadays. That's right.....he goes to them. But hang on.....maybe it's just an angle to get heaps of interesting stamps in US Passport One.